Instances of dietary errors have been increasing within the healthcare industry for years, much of which are associated with allergen control. According to The Food Allergy & Anaphylaxis Network, there are approximately 11 million Americans who suffer from some food allergy. This equates to four percent of the general population! It’s equally surprising to know that food-allergy related reactions account for over 30,000 emergency room visits per year, and as many as 200 deaths nationwide. Given these statistics, it’s more important now than ever for foodservice professionals to implement procedures to keep patients safe from food allergens. This article will provide you with tips you can use to help eliminate dietary errors, including reducing the chances that your patients experience an allergic reaction due to a meal they were served at your facility. Let’s get started. Food allergies can cause a variety of unexpected reactions ranging from swelling of the lips and tongue to difficulty breathing, hives, vomiting, and diarrhea. In extreme cases, a food allergy can even cause life-threatening reactions referred to as anaphylaxis. Sadly, even trace amounts of food can cause an allergic reaction in your patients. While it is possible for a person to be allergic to any food, more than 90% of all food allergies come from peanuts, tree nuts, eggs, soy, fish, shellfish, milk, and wheat. The San Jamar Allergen Saf-T-Zone® Mat will allow you to create an allergen-free zone by helping your kitchen staff quickly identify that allergen preparation is being done. 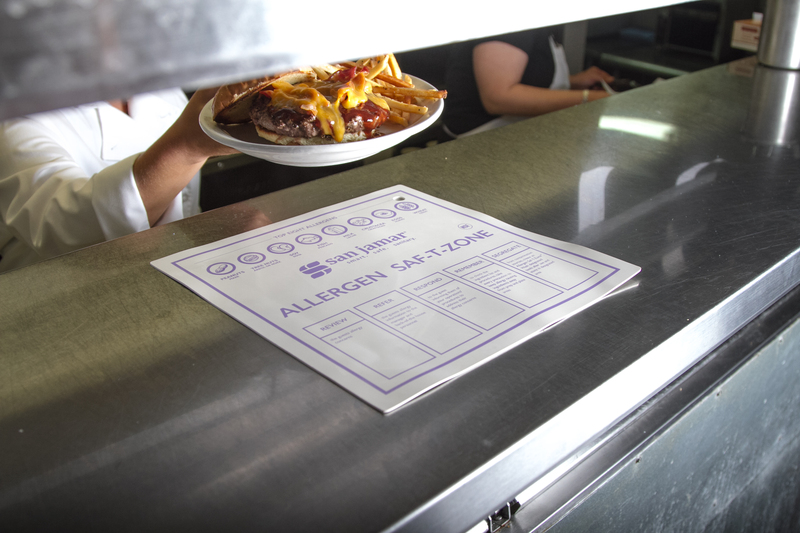 This foodservice allergen mat illustrates the eight most common food allergies via purple allergen colored text for easy identification. The San Jamar Allergen Saf-T-Zone® Mat comes in two sizes 24” by 30” and 12” by 12". The 24” by 30” mat should be used to designate a safe prep area for allergen-free foods, while the 12" by 12" mat should be used on the server window to signify that an allergen-free plate is ready to be served. These food allergen mats are not only durable but are easy to clean, making them the perfect fit for any foodservice kitchen. San Jamar Saf-T-Grip® cutting boards are available in HACCP color-coding colors to reduce the chances of cross-contamination in your facility's kitchen. These foodservice color-coded cutting boards come equipped with patented food safety hooks which allow for sanitary storage and transport. The board's anti-slip grip corners will help keep it securely in place, eliminating your need to utilize an unsanitary wet towel. All San Jamar Saf-T-Grip® cutting boards are NSF certified, are dishwasher safe, and are built to last using durable co-polymer. 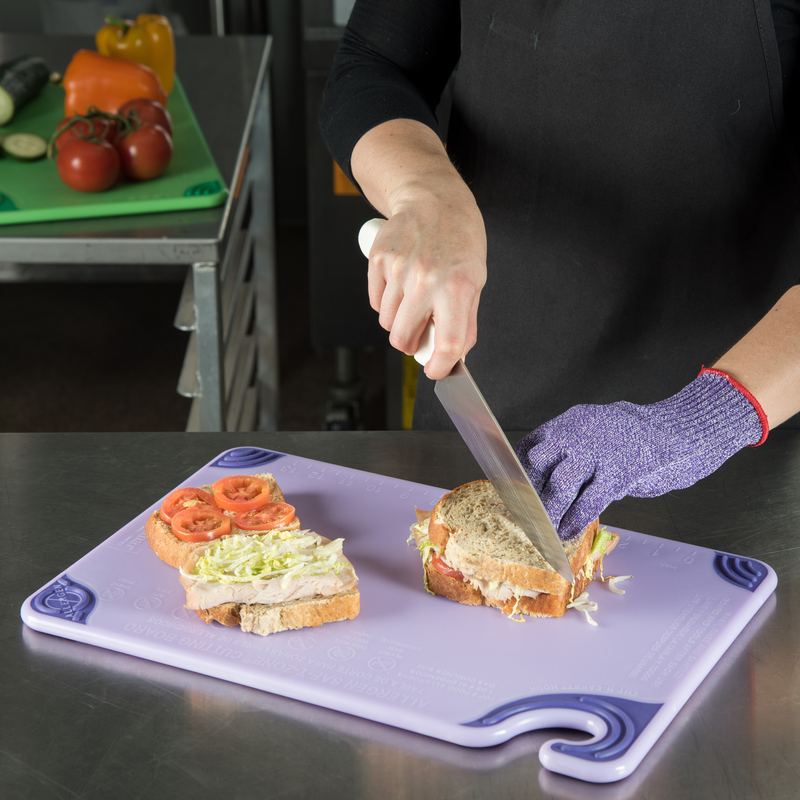 These foodservice cutting boards are the perfect solution to help you take your food safety program to the next level. According to Health Care Business & Technology, the second and third most common types of dietary errors in healthcare foodservice are patients receiving the wrong diet and patients receiving meals that were meant for others. Since every patient has individual nutritional requirements, receiving the wrong diet, or receiving a different patient's tray could cause huge problems. As a foodservice professional working in the healthcare industry, it’s of utmost importance to always aim for 100% meal accuracy. The only way to ensure your patients receive the correct diet and correct meal every time is to get organized. 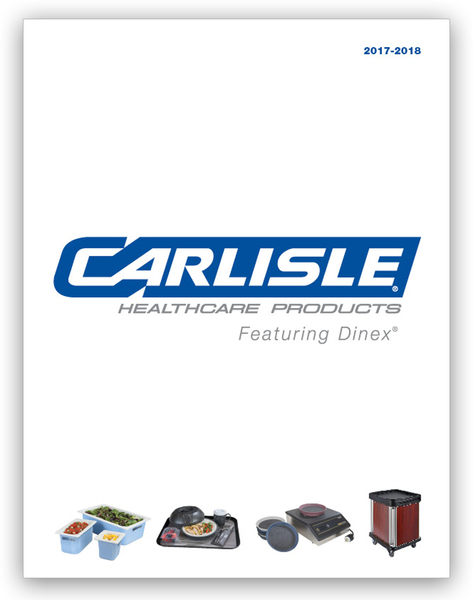 The perfect solution to help you achieve patient meal accuracy are Dinex patient tray tickets. Implementing a tray ticketing system will help you drastically reduce dietary errors at your facility. These foodservice tray tickets will also create a "paper trail" to help you quickly identify mistakes, and provide you with an opportunity to coach staff if a mistake is made. Dinex foodservice tray tickets are available in standard configurations for laser printers and copiers, but specialty sizes are available upon request. These tray tickets are an affordable solution to help you reduce the chances of making a costly mistake. One of the best things you can do to reduce dietary errors at your facility is to educate your staff and patients. It's important to keep in mind that you will educate your patients and staff differently. For instance, education aimed towards staff should focus on allergens and how to avoid allergic reactions among your patients, while education to your patients should focus on personal hygiene, symptom identification, and allergen avoidance. Let's examine these two topics in more detail. Teach your staff about the importance of allergen-safe food preparation stations. Teach them how to follow your facility’s policies and procedures to prevent allergic reactions and cross-contamination. Highly consider posting FARE’s cross-contact poster around your facility’s kitchen to remind your staff about proper food safety procedures. Encourage the use of allergen mats to easily identify preparation stations. Educate your staff on the importance of reading food labels. Correctly reading a food label could be the difference between life and death in one of your patients. Educate your staff on the importance of washing their hands after handling and consuming food. Also, stress the importance of adequately cleaning all tables and chairs in the cafeteria with an all-purpose cleaning agent before each meal. It's essential for your staff to be able to identify the signs of an allergic reaction. Consider providing each employee with FARE’s “Common Symptoms of Anaphylaxis” poster, and also consider posting copies of this poster around your facility’s kitchen. Stress the importance of communication among staff. Educate your staff on the importance of checking for patients' food allergies before serving a meal. Teach your staff to store common food allergens away from other foods, and suggest that they use color-coded tools to help reduce the risk of cross-contamination. If your facility utilizes a fryer, be sure to educate your staff on the importance of not using the same fryer or oil for foods that include fish or nuts. Encourage your staff members to take additional courses on food safety. Some excellent programs include AllerTrain®, ServeSafe™ Allergens Online Course, and FARE’s numerous free educational resources. This informational packet will help educate patients who have been newly diagnosed with a food allergy. It consists of a checklist for getting started, tips for avoiding allergens and cross-contamination, and an extensive collection of FAQs. You can order copies for free by visiting FARE’s website. Teaching your patients how to read food labels correctly is vital to reducing the chances of them experiencing allergic reactions. Emphasize the importance of learning common allergen statements such as "may contain," "peanut-free," and "egg-free." An excellent resource to help you educate your patients on these statements can be found on FARE’s website. Educating your patients on how to avoid food allergies can go a long way in reducing the instances of allergic reactions at your facility. This sheet can help you properly educate your patients on how to avoid food allergies. While certain aspects of personal hygiene may seem like common sense, it’s still important to cover the basics of personal hygiene with your patients. For instance, always encourage them to wash their hands before they eat or serve or prepare food for other patients. You want to keep the dialogue about food safety and food allergens between you and your patients open. Encourage them to ask questions when they are confused. Displaying that you are willing to answer any questions they have will reduce the instances of patients taking unnecessary risks with food because they are afraid to ask questions. While food allergies in the United States are on the rise, there are things you can do to reduce the instances of allergic reactions at your facility. Focusing on allergen control by investing in products to help you create safe preparation stations should be a key initiative for your healthcare facility in 2018. Items such as San Jamar Allergen Saf-T-Zone® Mats and San Jamar Saf-T-Grip® cutting boards will help you ensure your patients receive meals that are free from cross-contamination, while Dinex patient tray tickets will help ensure your patients receive the correct meal every time. Lastly, placing a strong emphasis on staff and patient food allergen education will help you drastically reduce the negative consequences associated with allergic reactions to food. While it isn’t possible to cure food allergies, it is possible to put procedures in place to reduce instances of allergic reactions to food. It all starts with you.